Tajo del Sol - Turismo de Íllora - Granada - Descúbrela paso a paso. The route starts at Fuente Alta, at the south slope of Sierra de Madrid, you must remember that you must go by car there in order to start the route, taking the route to Montefrío but changing to the camino de la Virgen after the mill of the Saints. Fuente Alta is a water reservoir which belongs to Íllora. the difference to other fountains is that it is situated just on the ground land, where water can stay as a reservoir, as the water stays, the anfibi (alytes dickhilleni) called frog in english is found in its round abouts. After watching its small larf kids, we leave the fountain behind and go up to Las Nogueras, until coming to the Cerro de La Laguna (1.087 m) from there we go down to Fuente Grande whose water reservoir is in deficit because Puerto Lope is using the water. There the road will go up, always going to the left, an circular way coming by the start again, at the beginning of that road we will see a signal which is not correct. 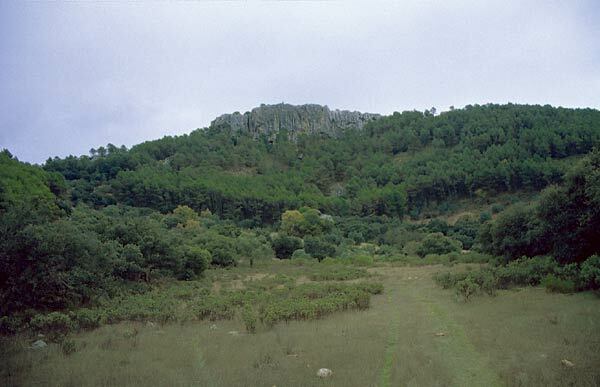 But there we will go into the forest passing it until we come to Fuente de Rosal. After this point you must be careful to the signals of the road, going up to the Mountain of Espinar y la Rosa. At Cerro Prieto, in honor of its name coming through a big forest and even in one of the best states of the municipial. Going up a road where nobody normally goes through except hunters. After that you must look for the Fountain del Rosal. Where we can get fresh water. Then we go to the Cañada Real del gallego until the propertie of la rosilla. Ther we must take the way between el Lagunazo 1.276 m and the Tajo del Sol 1.258m. Our object. Since we can sightseeing from its van point. If you want to take a rest there, do it, because then you must take the way back. You have two options of going back the same way you came up, or going to Sierra Madrid and seen the Fountain of Madrid, where water is lovely fresh as too.